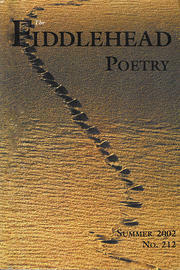 7 Shawna Lemay: Three Poems from "Anatomy of a Still Life"
100 Eric Barstad: Four Poems from "Towards an Aviary"
The trail of a sand adder on a large dune near Pomona in Namibia. Photograph from Odysseys: Meditations and Thoughts for a Life's Journey. A Phyllis Bruce Book, HarperCollins Publishers Ltd. 1998.